If you’ve been to your bank to use their Euro coin exchange service, you’ll have been very disappointed to find that they don’t have one. The good news is that Cash4Coins can help. Our Euro coin exchange service is the perfect way to convert your left over holiday money or currency from business trips abroad back into Sterling. Many of us have some euro-zone currency lying around and since the wide spread adoption of the Euro there is a lot of Euro coins and low denomination notes floating around that are going to waste. 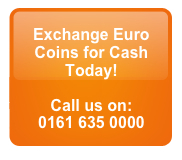 So instead of the euro coins just sitting there why not use our Euro coin exchange service to change them into Sterling? Our service is fast and simple – you post us your euro coins, we count and sort them and then provide you with a valuation offer. If you are happy with this we then send payment directly to your bank (and it usually happens in around 2 hours). In the event that you’re not happy with the valuation then we will return your currency at our expense – this is our 100% satisfaction guarantee. Above certain weights we’ll even collect your foreign coins for FREE – please go to ‘How to send us coins‘ for full details. We also operate a drop-off service with over 4700 location across the UK. It could not be easier! This is why many people are using our Euro Coin Exchange service to turn those useless old foreign coins into cash. You can get paid yourself or maybe collect with your friends and colleagues for your local school, club or charity. Whatever you do don’t let that euro currency go to waste – contact the Euro coin exchange experts at Cash4Coins and let us exchange your foreign coins and notes. Our Euro coin exchange service is the perfect option for individuals, companies, schools and charities and allows you to make use of that foreign currency that would otherwise not be used. What could you do with some extra cash? Even if it’s not that much in the end, something is better than nothing. What’s more, we won’t even ask you to sort or count your coins as we do that bit for you. You are never under any obligation to exchange your Euro coins with us and if you are not happy with the valuation we send you, we will send you back your coins completely free of charge. When it comes to a Euro coin exchange service, nobody does it better or quicker than Cash4Coins and it is little wonder that we are the number one choice for people everywhere. We can exchange any currency and we are here to give you advice on any aspect of foreign coin or note exchange. We can even give you some great fundraising ideas for your school or charity! To send us your coins and notes go to ‘How to send us coins‘ page. If you’d like to discuss any aspect of fundraising or our Euro coin exchange service then we’d be only too pleased to help you.